You can now set the option to skip the Purchase page for files. This will skip the page with the “buy” button and send the user straight to the payment after clicking your purchase link. Yesterday we pushed out our new front page design. We hope it gives the app a bit of definition but, more importantly, does a far better job of explaining what Sellwire is and how it works. So head on over and check out the new look and let us know what you think. From today you can now edit the status of an order to be “Refunded”. This allows you to keep track of orders that you have refunded and means they won’t show up in the reports as positive sales. 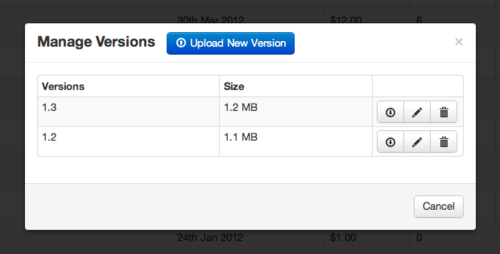 Today we launched a new feature: version management. Now you can have multiple “versions” per file. This allows you to upload a new “version” every time you update your file, thats it. Then when users visit their receipt page, the will have the option to download older versions of the file (the newest version being the default). This makes the process of providing upgrades to your customers as simple as uploading a new file and giving it a version number. Hi and welcome to the Sellwire blog, the official blog for sellwire.net. When we push any updates or have any news worth sharing (relating to Sellwire) we will post it here so you can stay in the loop on all the awesome things we have planned for Sellwire. So don’t forget to subscribe to the RSS feed or follow us on Twitter and stay up to date.